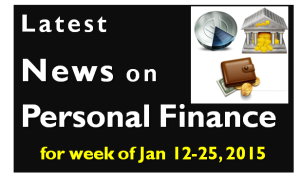 In this post we cover the major Personal Finance news that happened in the week of January 12 – 25, 2015. Mutual Fund AMCs have decided to discontinue with Dividend Reinvestment option for their ELSS (Equity Linked Saving Scheme), popularly known as Tax Saving Mutual Funds. This was done as there were number of complaints from customers at the time of withdrawal as they were not able to withdraw full amount as every dividend that is reinvested is again locked for 3 years. This is a good step and would be less confusing for customers. RBI has proposed changes in the way banks determine their Base rate and the spread for determining loan interest rate. Until now banks used to manipulate these so that the benefit was not being passed to existing customers and still offering lower interest rates to new customers. Going forward the banks would need to offer same interest rate to customers with similar risk profile. Read more details here. Reserve Bank of India (RBI) has allowed Indians travelling to Nepal and Bhutan to carry Rs 500 and Rs 1000 currency notes. However you cannot carry more than Rs 25,000. Earlier only currency denominations only up to Rs 100 was allowed with no restriction on amount of money you could carry. This was mainly to restrict the menace of counterfeit currency of higher denominations. This rule is effective from January 22, 2015. ICICI Bank customers can now transfer money, check account balance, check last three transactions and recharge prepaid mobile through their Twitter account. You can check this feature on ICICI Bank Website. HDFC Focused Equity Fund – This is closed ended fund which would invest in securities specified under the Rajiv Gandhi Equity Savings Scheme. In case you are eligible for tax saving by investing in RGESS, you might want to look into the fund. The NFO closes on February 13, 2015. Birla Sun Life Mutual Fund has launched the Birla Sun Life Manufacturing Equity Fund, an open ended equity mutual fund with mandate to invest in manufacturing related stocks. The NFO closes on January 27. JP Morgan Mutual Fund has launched the JP Morgan India Economic Resurgence Fund an open ended equity mutual fund with mandate to invest in stocks with a dynamic allocation between various sectors at different stages of economic activity. The NFO closes on January 27. I personally see no reason to invest in Birla Sun Life Manufacturing Equity Fund or JP Morgan India Economic Resurgence Fund as both of them are same old concept with new marketing. I had written earlier stating – Why you should not invest in NFOs?